When the members of the Algonquin Round Table gathered for lunch, the last thing they expected to find was the dead body of a theater critic under their table. 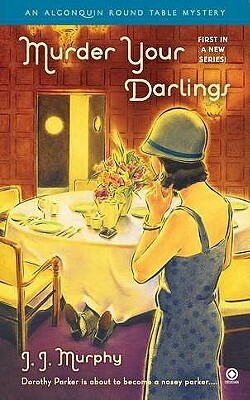 From Round Table, to speakeasy, and all over the city of New York, Dorothy Parker has to chase down a murderer before the police try to pin the crime on her or one of her gang. She has plenty of help from her friends Peter Benchley and a visiting Billy Faulkner. The Algonquin Round Table was a celebrated group of New York City writers, critics, actors and wits. Gathering initially as part of a practical joke, members of “The Vicious Circle”, as they dubbed themselves, met for lunch each day at the Algonquin Hotel from 1919 until roughly 1929. At these luncheons they engaged in wisecracks, wordplay and witticisms that, through the newspaper columns of Round Table members, were disseminated across the country. The mystery was good, and the characters were larger than life, but there were so many characters that it did get a little confusing at first. Once I figured out who everyone was though, I really enjoyed it. I loved the banter between Dorothy and Peter – they reminded me a bit of Cary Grant and Katherine Hepburn in Bringing Up Baby. I highly recommend this one if you enjoy a little humor with your mystery. Visit the Algonquin Hotel’s website for more info on the Round Table. This one sounds like fun! !